When Sandra (Sandy) Lamb was asked to join the Baldwinsville Community Foundation Dollars for Scholars board, she never expected that commitment to last 18 years, though, many would ask, “Why not?” Sandy had already made a career out of helping students plan for their futures post-graduation running the local high school’s Career Resource Center. Her deep commitment to her students was the main reason for joining, and what she found sustaining her as a volunteer. As the recording secretary for the Baldwinsville Community Foundation Dollars for Scholars chapter, Sandy put her planning and organization skills to great use. Not long after joining the Dollars for Scholars board, Sandy began to take the helm of a couple of the chapter’s larger events. In 2002, the chapter started their annual phone-a-thon fundraiser. Prior to the phone-a-thon the chapter had primarily relied on fruit sales to raise the bulk of their scholarship dollars. With Sandra’s help, the chapter set-up shop in the high school cafeteria and Verizon donated cellphones for the students to use during the week-long event. Over the years, the event grew and expanded. Students were put on teams to compete for various fundraising goals, phone-a-thon t-shirts were created, and baked goods were donated to the student callers. The phone-a-thon became so renowned in the community that they had an excess of student volunteers and community members themselves would call if they had not heard from a student. As a result of those efforts the chapter raised between $35,000 and $40,000 just from this one week. Sandy’s responsibilities continued to grow from there, and she coordinated the annual Moving Up Day, the chapter’s award ceremony where over $100,000 in scholarships are awarded each year to 130 students from this New York community. Around 130 presenters from the community come and award scholarships to students, and there was always a reception for the presenters beforehand. The reception for the presenters was always such a big deal, as many of the scholarships were memorials, and it was a time for the family members to come and celebrate the goodness of that life. “The kids are always just so appreciative. They’re so cute. They usually give the presenter a big hug and the whole audience goes, ‘awe.’” Sandy reminisced. One year, after receiving a memorial scholarship named for a community member who died in an unexpected accident, the student showed up on the door step of the mother’s home to thank her personally. These touching stories kept Sandy coming back to her Dollars for Scholars role year after year. 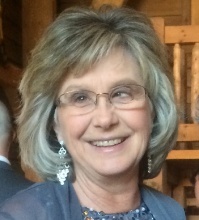 In addition to her work with local students, Sandy has dedicated many years at her local church singing in the choir and serving on various committees. Sandy admits volunteering can be a lot of work, but in her opinion, it’s worth it. “If you’re going to volunteer, commit to volunteer. Be prepared to work. But know the rewards are much greater than the work you put into it. The students are so appreciative,” she said. 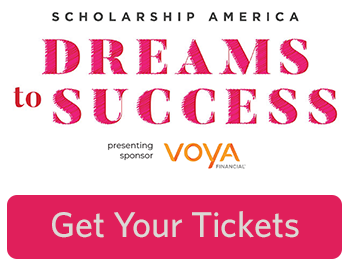 Sandy and her husband are excited to attend the Dreams to Success Dinner in Washington, D.C. this May where she will be honored by Scholarship America.